My Pipe Collection Thus Far ..
Nice. I have a Savinelli unfinished 320 that is great. I got a Sav 320 unfinished back in November and I am loving the coloring she is taking on! cowboysurfer .. I have one of those in my 'shopping cart' in a website I often buy from .. The Savinelli unfinished 320 ..
You won't regret adding her to the stable. Γ γ gamma, γάμμα .. March 2018 / Brebbia Stand Up 2801 Tomato Sandblast .. in action ..
My Dad’s pipes top row Orlik’s, Kaywoodies, Webber and two no names, My Grandad’s bottom row Kaywoodies, Webber, Edwards and Medico. Those pipes are all beauties, sir! I've a Sav 320 that never gets any use...I can't clench it. Not even broken in. But it's pretty to look at! 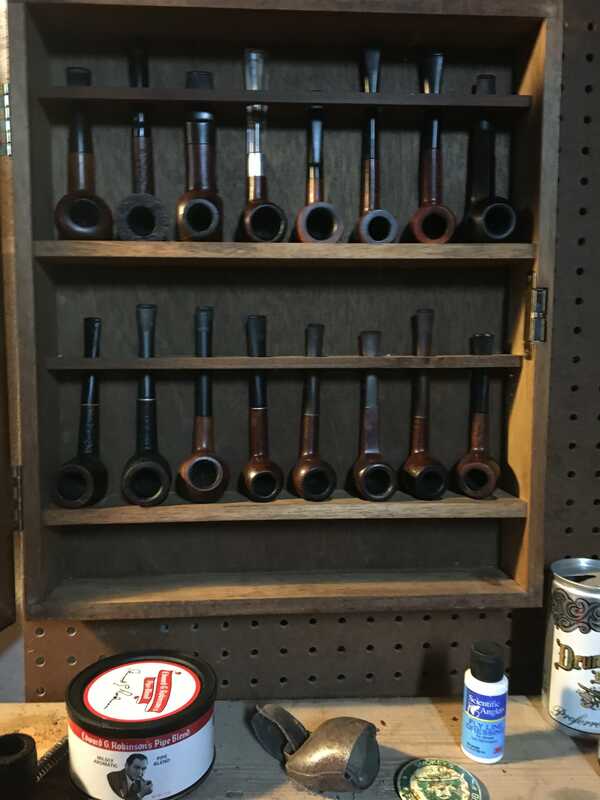 I wish I had even a single pipe that belonged to my father or grandfather. I'm fortunate for sure, I'll smoke one of them occasionally and the ghosting doesn't bother me one bit they never leave the house.